Pretty Little Liars returns to ABC Family tonight with an all new Tuesday July 21, season 6 Episode 7 called “O Brother, Where Art Thou,” and we have your recap below. On tonight’s episode, Charles plans to come home for his birthday and Jason [Drew Van Acker] looks forward to the reunion, but Mr. DiLaurentis would prefer to take Jason and Ali out of town. Meanwhile, Spencer and Hanna want to capture Charles, and Emily and Aria want to stay away from him. On the last episode, with all signs pointing to Lesli as the tormentor in the hoodie, the PLLs were on a mission to get concrete proof before bringing their findings to the police. But as the girls ramped up their investigation, “A’s” threats escalated. Meanwhile, a friend of Emily’s made her a surprising offer, and Spencer was pressured by her family to make an important decision. Did you watch the last episode? If you missed it, we have a full and detailed recap right here for you. The season 6 episode 7 of PRETTY LITTLE LIARS is going to be really exciting and we’ll be recapping it for you right here. Tonight’s episode of Pretty Little Liars kicks off with Aria and Spencer watching a video on YouTube of how to remove tracking chips from dogs. 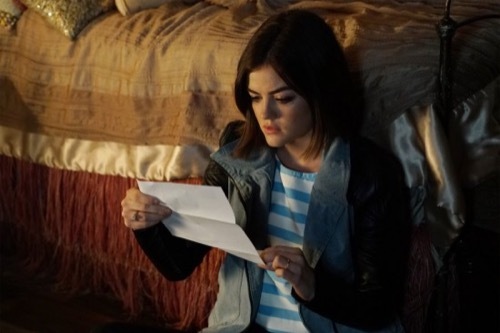 Aria gets a text message from Mona, she set up a meeting with the liars and Lesli. Spencer starts calling Alison to tell her about the meeting with Lesli but she doesn’t pick up, she is in the car with her Dad and he is driving her out of town and won’t tell her where they are going. She finds the birthday card in the car that her dad got from Charles – she realizes that her brother is alive and he is coming for them. The next morning Hanna is getting ready for work, her mom surprises her with a check for $30,000 – it was from a scholarship sponsored by the Carassimi Group, now Hanna can afford to go to college. She asks her mother what the Carassimi Group is, Ashley explains that Jason DiLaurentis recommended them when she was working with them. Emily heads to The Brew, she runs in to Sara’s friend Claire. Claire has been looking all over for Sara. Emily explains that she is at therapy, and offers to have her call Claire afterwards. Meanwhile at Spencer’s house Toby arrives and surprises her – he has been out of town at a seminar. Spencer greets him, and then says that she can’t hang out – she lies and says she has to meet up with Aria to work on her graduation speech. Spencer, Aria, and Hanna meet up with Mona – Lesli doesn’t show up. She chickened out because she “doesn’t want a confrontation.” Mona begs them to leave Lesli alone, she swears that Lesli doesn’t know Charles. Lorenzo shows up at Alison’s house, Jason explains that she is out of town with her dad. Lorenzo is worried because Alison isn’t returning his phone calls. Jason is confused, he didn’t even know that they were talking to each other. Lorenzo is suspicious – he thinks that Jason is hiding something about where Alison really went. After Lorenzo leaves, Jason finds an invitation on his front parch inviting him to Charles’ birthday party. Aria heads home and begins throwing out all of her “creepy dolls” her brother Mike comes in to her room. He asks Aria if she told Mona not to talk to him, because Mona hasn’t returned his phone calls since she was rescued. He left her 100 messages and Mona won’t see him or speak to him. Aria swears that she had nothing to do with it. Meanwhile, Emily tags along with Sara to meet up with her friend Claire for dessert and it is super awkward. At the Brew, Spencer is talking to Hanna, she feels horrible about lying to Toby. Hanna whines that she wants to gt the hardware out of her neck. She googles the scholarship that she got – and The Carassimi Group is some sort of investment company, their website doesn’t say anything about a scholarship, but they do find out that The Carassimi Group is the same group that shut down Radley. Spencer and Hanna realize that “Carassimi” means “Beloved” in Latin, just like the note they found that said “beloved Charles.” They think that Charles might run the Carassimi Group. Spencer receives a panicked phone call from Alison. She tells Spencer that Charles is alive and he is coming home for his birthday – she explains that her dad has locked her in a hotel and wont let her go home. She is worried about Jason, she wants Spencer to warn him. Hanna, Aria, and Spencer rush to Jason’s house to talk to him about Charles. Lorenzo is sitting outside in his cop car, he asks them if he can help them – the girls lie and say that it is not important. Meanwhile, Mona finds Mike waiting in her bedroom for her, she is shocked that her mom let him in. Mona tells Mike that she doesn’t want to see him and she wants him to leave. Mona cries that she feels horrible about what she put Mike through, and forcing him to lie about her death. Mike confesses that he is “pissed as hell” at Mona, but all that matters is that she is alive. Spencer calls Toby over to her house, she says she has to tell him the truth – but makes him swear not to tell Detective Tanner. She shows Toby a picture of Jason’s mom holding him and Charles, she explains that Charles is Alison and Jason’s long lost brother and he is “A.” Toby is furious, he shouts at Spencer that she should have told the police this news weeks ago. He agrees to go find Jason, and he takes the GPS tracker, but he makes Spencer and the liars promise not to follow him. Before he leaves he spots a bag of the pot gummi bears that Spencer has been getting from the girl at the brew. He takes them with him to the police station and starts eating them, he takes Lorenzo with him to track Jason and they leave the police station. Meanwhile, Spencer and the other liars decide to disobey Toby and leave the house to find Jason anyways. Jason is at what appears to be an abandoned building, “A” sneaks in to the building in his black hoodie. Meanwhile, Mona picks up Alison at the hotel – she drugged her dad with sleeping pills so that she could sneak out to save Jason. Alison calls 911 while they are in the car, she tells the operator that her brother Charles DiLaurentis is “A” and her friends and family are in danger. The police rush to the DiLaurentis house and they find the birthday invitation on the counter with the address on it. Charles steps out of the shadow so that Jaosn can see him, and at the same time Toby and Lorenzo rush in with their guns drawn. The liars rush in right behind them, Toby is high as a kite and he falls on the floor. Charles begins throwing pipes and baseballs at everyone and Toby can’t get a clear shot. “A” runs out of the back door as the entire Rosewood police department charges in and they scream at the liars to put their hands up. After all of the commotion Hanna heads home and her mom screams at her, she wants her to take her scholarship and get out of the Rosewood and away from all of this mess. Hanna tells her mom that she has a bad feeling about the money because it is linked to the DiLaurentis Family. Hanna’s mom says that it is too late and she already cashed the check and deposited it in to the bank. At Aria’s house Mike checks in on her in her bedroom. She is crying because she has been fighting with her dad ever since she got home from the police station. Mike says that he talked to Mona, and they have decided to try and work things out between them. He tries to comfort Aria and tells her that he thinks what she did, trying to catch Charles, was really brave of her. Aria cries that she isn’t brave, she feels scared all of the time. At the police station Spencer cries to Toby about how sorry she is that he ate her weed gummies – he won’t speak to her. Toby tells her to go wait in the lobby for her mother.